Hey there! How was your weekend? My sister was in town, and we ended up spending too much money shopping in Anthropologie. It's amazing how quickly those sale items add up, isn't it? Good thing the latest addition to my son's "tween" room, didn't cost me a dime. 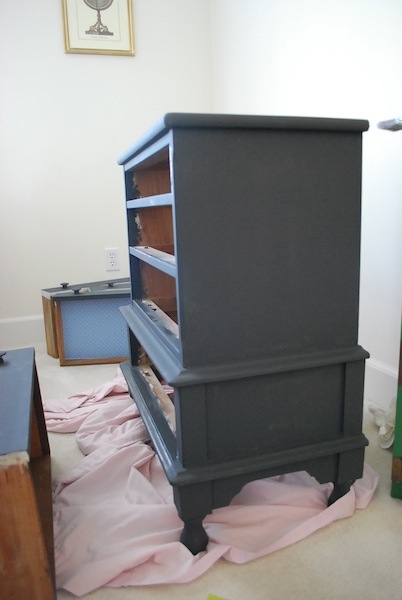 Using supplies I already had on hand, I created this faux zinc dresser. I want the room to have a classic, masculine look with a touch of industrial chic thrown in. So, when I saw this paint technique over at Melaine's blog, I knew it would be perfect for my son's room. The dresser I used for this project has been in my family for a long time. It was used in my uncle's childhood bedroom, and somehow ended up in my parents' house. When I moved into my first apartment after college, I confiscated it from my parents. I painted it white and used it as a nightstand for many years. When I was pregnant for the first time, I painted the drawer pulls to suit a baby nursery. Anyway, this little dresser has served our babies well for the past 12 years. But now that the boys are getting older, it's time for this dresser to get a more grown up look, too. I used supplies that I already had on hand. I painted the entire piece with two coats of ASCP in Graphite. When it dried, I put little drops of the metallic paint on top of the dresser. Following Melaine's tutorial, I dipped my paint brush in ASCP soft wax, and brushed through the drops of metallic paint. If you want more control over the metallic paint, brush the wax on a section of the furniture first. Then put the metallic paint on a paper plate and lightly dab it on the brush before applying it to the furniture. I finished by pouncing some dark wax in random spots for added dimension. This is a great paint technique for painters of any skill level. You really can't mess it up. Just play around with it until you get the look you want. I've made some more progress in this room. I'll be back soon to show you. Have a great day!! What an unusual chest with such pretty lines, I've never seen one like it. Your paint treatment turned out great! That looks great! It doesn't even look like the same dresser anymore. You wanted masculine and I would say that fits the bill perfectly. Looks so great...I am dying to get my hands on a bucket of that chalk paint! Beautiful. I've gotta pin it. Oh my this is gorgeous!!! This is a must try! Thanks for linking up. What a transformation! I am going to have to try this! That looks really great. It does look like zinc! Very cool! What a transformation! I'm always amazed at the difference a coat of paint can make - on walls or on furniture. Great job! Looks great...I am loving the chalk paint. What a great transformation. I love the fact that your dresser has been in your family for a long time and you used the same dresser for your first child's nursery. I'm all about keeping things in the family, especially when your able to create fabulous looks like this one! This is amazing!!! I am pretty sure I'm going to have to steal/copy/borrow this idea for my teen boy's room. That is such a beautiful finish...perfect for the room! Your ever changing family heirloom has such a great history!!! I love it's new chic look. I'm going to have to try Melanie's technique. I love what a little paint can do!!! Please stop by StoneGable and join TUTORIALS TIPS AND TIDBITS. Your great dyi upscale family chest will be a welcomed additon! Linky goes live Wednesday at 8:00pm. I really like the faux zinc dresser, I have never seen anything quite like it. I am not that crafty but my husband might be able to transform our boring dresser into something like this, I'll have to share this with him and see.